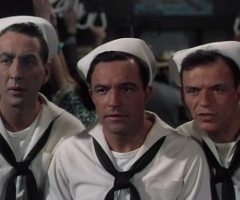 In a New York harbor, three sailors have just gotten off the boat, and are excited for their 24 hour shore leave. Gabey (Gene Kelly), Chip (Frank Sinatra), and Ozzie (Jules Munshin) are all planning to find adventure and romance before the day is out, but when Gabey sets his sites on a small time celebrity “Ms. Turnstiles” (Vera- Ellen) he threatens to ruin every ones time by going on a wild goose chase to look for her. Fortunately, along the way, the sailors find some nice gals to help them in the search and, as adventure ensues, they realize their day’s may not have been ruined by this chase after all. An incredibly lively movie all the way through. It did a fantastic job throwing together a cast with remarkable talents, and making them all shine together and individually. Sinatra and Kelly are a pairing that blew my mind with excitement; while even one of them would be enough to make me ecstatic, the two men together sent me over the moon. Kelly, who choreographed and co-directed the film, pulled out all the dancing stops while Sinatra serenaded you. The result? The most charming pair anyone could have imagined. The females in the movie held their own as well. 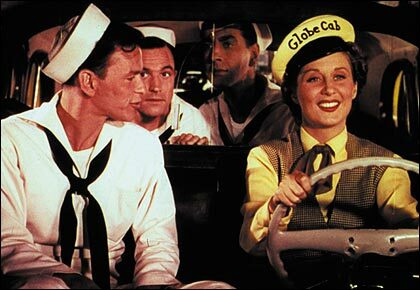 Especially Betty Garrett who plays a quirky cab driver that quickly sets her sites on Sinatra’s character, Chip. She brought her own style of humor to this film that made it all the more enjoyable. But as much as I loved the individual performances everyone really put their best foot forward when they were all together. The coupling of the small town sailors with the big city girls created such a wonderful story, of such sweet infatuation, that it made me giggle at their giddiness. The lyrics were so-so and the plot simple, but it was more than supplemented by the unbelievable cast. It makes a movie a pleasure to watch when you have a crew such as these men and women. MGM got it right once again, combining immense talent with a modified Broadway hit, to make one brilliant movie that showcases all the cast has to offer. Gene Kelly’s directorial debut is one to be watched and remembered. 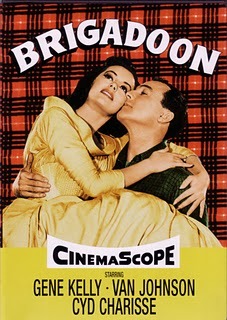 This film was a typical World War II movie. Flying flags and happily marching troops, that would make anyone feel patriotic, took over. 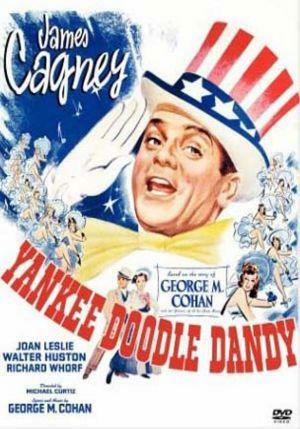 I can’t say that the patriotic character wasn’t an accurate depiction of Cohan’s plays, having made his career writing patriotic songs that rallied the hearts of even the least interested of souls. And there’s no doubt that he waved around that red, white, and blue a few times as well. Cagney won an Oscar for his role in this film as Best Actor, the first and only he would ever win. His acting was tremendous and his dancing even more so. He dazzled us all with a chaotic kind of tap, that worked so well it sometimes looked like he was on wires. Of course he didn’t so much sing the lyrics, as he did say them in a louder voice, but the music was catchy otherwise. Unfortunately, I think he was the best part of this movie. The plot was slow, and there are only so many times you can see a flag waving before you start to wonder when the plot is going to develop. The movie seemed to hide behind its American spirit rather than to use it to it’s advantage, and I just kept waiting for something exciting to happen. It may have been an affective tool during a World War, but now it just seems to drown itself in a sea of flashy, Broadway nationalism. This movie did have its moments, and I could certainly see why others might enjoy it. But I found it hard to grow attached to any of the characters, and the plot was soon worn out. However, if you were ever in a “high flying flag” kind of mood, or if you happen to have been born on the 4th of July, this movie would be able to satisfy your craving for a dose of Uncle Sam. It’s 1955, and Nathan Detroit (Frank Sinatra) has run a successful floating craps game in New York City for years. However, the police choose now to start cracking down on him, so everyone is a little more than skeptical to let him host it at their place. The only joint that will let him in the door is only willing to part with the space for a $1000 down payment. Knowing he could never get that kind of cash until after the game had already taken place, Nathan was out of options. 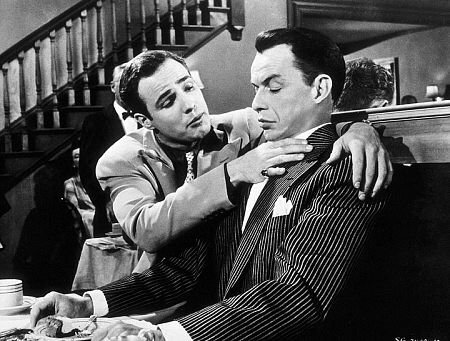 So, to get the cash he made a bet with the big time gambler Sky Masterson (Marlon Brando). 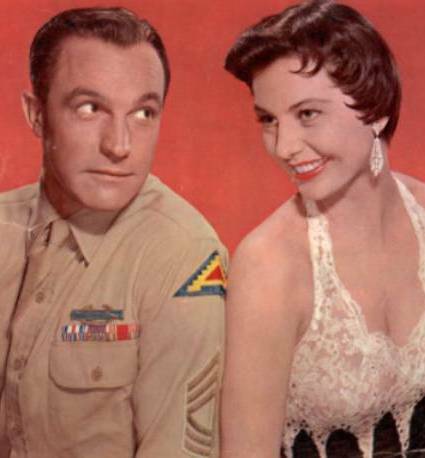 He bet that, even a ladies man like Sky, couldn’t get Sergeant Sarah Brown (Jean Simmons), a missionary with unshaking morals, to go on a date to Cuba with him. Meanwhile Nathan has to avoid getting into trouble not only with the law, but also with someone who frightens him far more, his long time fiancé (Vivian Blaine) who believes that his gambling days were over long ago. This incredibly stylized version of NYC held a certain charm to it that made it all the more fascinating. The actors seemed to be purposefully acting it out as if they were on stage, over enunciating and not once using the word “can’t” when they could use “cannot.” I felt as if they all had speech therapists that were very proud of them, and it only made the movie that much more hilarious. The entire film was plastered with quick quips and memorable lines. Most of my favorites came from Marlon Brando, a man I never thought I would see sing and dance. The man we all know and love as the Godfather singing “Luck Be a Lady” was beyond my realm of imagination. I thought at first they had dubbed over his voice, but no, it was all him. And while his voice lacked the power and gusto I would have liked to have heard in some of these songs, he could certainly hold a note. 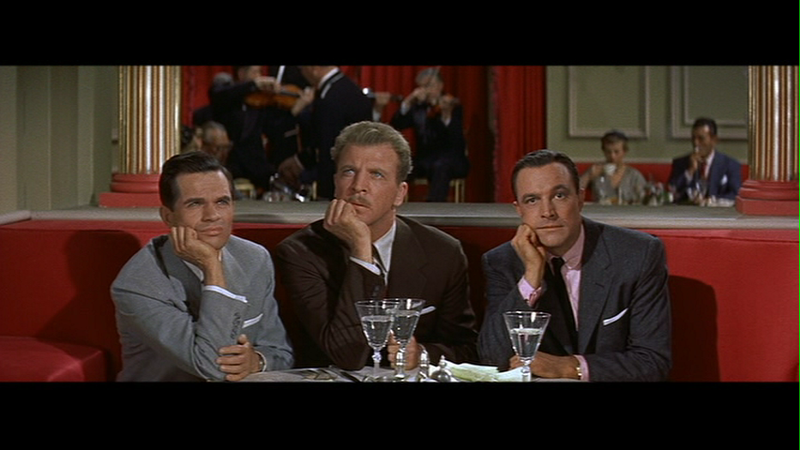 The rest of the film was peppered with an interesting array of singers. While Frank Sinatra was as melodic as always, some others left something to be desired. However, the genius lyrics and acting compensated nicely, so by the end you are left with a surprisingly wonderful musical. The choice of picking non-musical actors for the lead roles was a risk that paid off in the end. 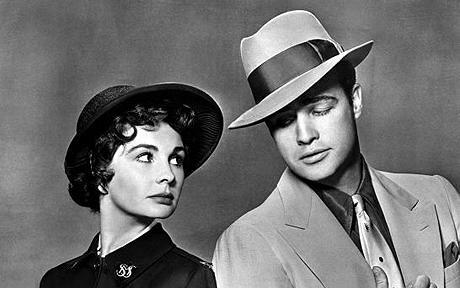 What the actors lacked in vocals, they more than made up for in charm and humor, especially Brando. If you want a laugh it is worth the watch. Three war buddies have just returned home, and they think that their friendships will last forever, but their favorite local bartender says differently. So, the three men make a bet. They will all meet back in that same bar in ten years, and they know they will be as good of friends as ever. They all go off in their separate directions, and over the years they lose sight of their dreams. Angie Valentine (Michael Kidd) owns a burger joint that he wishes was a five-star restaurant. Doug Hallerton (Dan Daily) gave up his dreams of being an artist to follow a more practical career, and Ted Riley (Gene Kelly) has made his living by gambling and cheating. They have all changed, so when they meet once more they can’t seem to get along, but a local TV host has decided to secretly lure them onto her stage to showcase their “happy” reunion. Cyd Charisse also stars in this film as the know-it-all woman who is charged with the task of concocting this whole scheme. She played her character wonderfully, and it was fantastic to see her and Kelly reunite after doing Brigadoon together. Her dancing was as entertaining and looked as effortless as ever, though it was the three men who really stole the show. All of them did a fantastic job in capturing many great moments in dance. Gene Kelly had one scene in particular where he rode around on roller-skates, it was the type of dance that could rival his classic number in Singin’ In the Rain, where he dazzled us all dancing and singing to the number the movie is named for. While the score is fairly ordinary, I still believe this movie just missed being a classic. Many of the actors had their voices dubbed over in this movie, including Charisse and Kidd, so it is clear that they really wanted to focus on the choreography rather than vocals. If they had a little bit more of the latter this movie would have hit it out of the park. Gene Kelly who acted in, and co-directed this film, is one of my favorites, and I don’t think you could go wrong with one of his movies. The novelty dance numbers make this movie worth seeing alone, and the slightly darker story line tops it off. This is a supremely underrated movie for anyone who wants to be visually wowed. The famous dancing duo, Don Hewes (Fred Astaire) and Nadine Hale (Ann Miller), are about to go on tour when Nadine decides that she is going to take her own solo job and leave Don in the dust. Don is heartbroken, having lost the love of his life and popular dancing companion in one foul swoop. He’s so upset that he literally picks the next dancer he sees to replace her. Hannah Brown (Judy Garland) is just a small time performer in an even smaller town bar, but it is now up to Don to make her into something great! To prove, to himself and Nadine, that they can out-dance her any day. Love and infatuation play a huge part in this movie, the greatest part about it was that there wasn’t just a love triangle but a love square. Ann Miller and Peter Lawford play excellent supporting roles that are also entangled in this messy situation, which makes up the bulk of the plot. The movie was also filled with cute and comedic moments. Judy Garland really shone, bringing out her funny side, but don’t worry she brought out plenty of her classic deep voice too. Then there was Fred Astaire who was really in his dancing element in this movie. Right off the bat he brings out an incredibly entertaining song and dance number to start out the movie, and the entertainment only continues throughout. 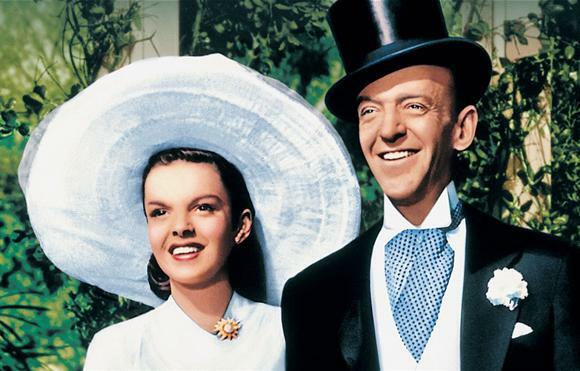 The pairing of Garland and Astaire couldn’t have been more perfect, each adding their own personal expertise’s and making one brilliant show. Unfortunately, the love square that was so interesting at the beginning didn’t really pan out to meet my expectations in the end. However, this movie turned out with a lovely conclusion (if just a bit flawed), and catchy lyrics ran throughout the movie, ones that I could happily sing along to. This is a movie I would gladly sit through and watch again. It only seems natural that it won an Oscar for Best Music. It truly was one of my favorites and I would recommend it to anyone who wants to watch a well-written and well-performed movie that just makes you smile all the way through. In the Scottish Countryside two Americans have gotten completely lost. Tommy Albright (Gene Kelly) and his best friend Jeff (Van Johnson) are in the middle of nowhere according to the map, but mysteriously they see a small village emerge from the mist. When they enter the town everyone treats them as if they had never seen an outsider before. The only person who isn’t afraid of the seemingly out-of-place intruders is Fiona Cambell (Cyd Charisse), who is getting ready for her sister’s wedding, as the whole town is. Tommy and Fiona immediately fall for each other, but before they can be together he must figure out this odd towns biggest secret, and be able to live with it. This quirky and romantic film was a bit of a flop when it first came out. Understandably they couldn’t actually film in Scotland because the production cost would have been too high, so unfortunately the sets looked like sets instead of roaming hills and country side. However, the musical tunes and lovable characters made it worth putting up with the painted sets and loud costumes. Gene Kelly and Cyd Charisse had many dancing scenes in this film, their graceful ballet made the movie all the more romantic. The entire cast, even many of the extras, were wonderful dancers and many of them got to show it off. I was pleasantly surprised that by the end of the movie there had been very few drawn out dancing scenes, which many Kelly films tend to succumb to. This is understandable since he was such a talented dancer, but they are rarely necessary to the plot and the movies can sometimes drown in them. Instead there remained a nice balance throughout the film of singing, humor, romanticism, and choreography. Even a little heartbreak was thrown in, which made the film that much more touching. The original Broadway hit was translated very well onto the big screen for everyone to enjoy. Dancing couples, wedding preparations, skeptical townsfolk, and a whole plethora of other eccentric touches make this movie a good one to watch on a night in. In 1903 all of St. Louis is looking forward to hosting the World’s Fair, and they are feverishly getting ready for it, including the tight-knit Smith family. 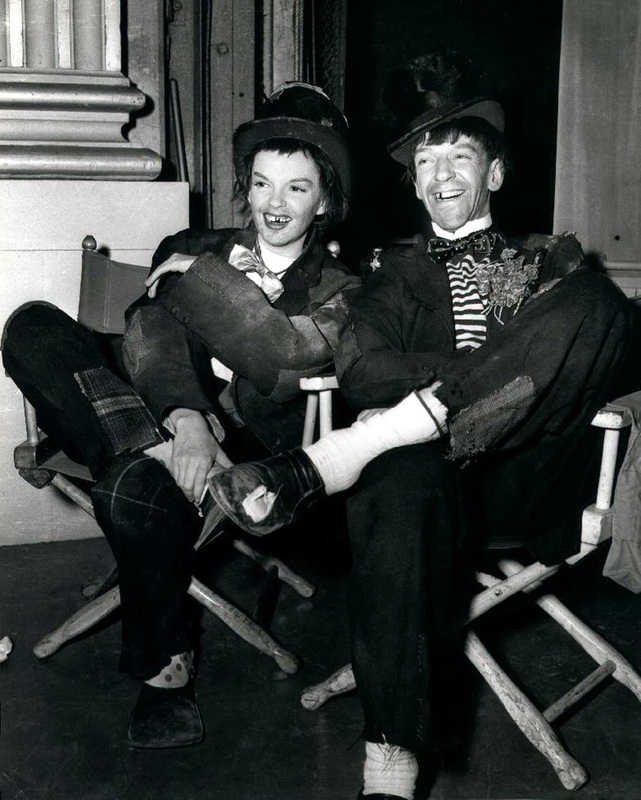 Judy Garland stars as Ester Smith who, through all the excitement going on around her, has managed to fall for the boy next door, John Truett (Tom Drake). The problem is that he has no idea she exists. Meanwhile, both of Ester’s older siblings are having love troubles of their own, and they must find a way to help and support each other even when their younger, very troublesome sisters are reeking havoc. A cute movie, while not having the most brilliant of plots, certainly can put a smile on your face. Judy Garland shines with her beautiful voice, singing the vast majority of the songs. Though I was pleasantly surprised when Mr. Smith (Leon Ames) had his moment in the vocal spotlight, during a particularly heartwarming makeup scene between him and his family. Judy Garland’s rendition of the original “Have Yourself A Merry Little Christmas” is my favorite by far. Reminding us that the song was not always the cheery tune we know, but beautiful nonetheless, and it nearly brought tears to my eyes. A wonderful supporting cast included a refreshingly odd younger sibling “Tootie” (Margaret O’Brien), and Tom Drake did an excellent job playing the perfect gentleman and love interest. These supporting characters make up the hilarity of the movie. I wouldn’t have enjoyed it nearly as much if Tootie hadn’t been there to be the fantastically mischievous, and exaggerating little girl, who went out on Halloween to play tricks on the neighbors. I do have to make a small side note, that the movie was more about getting to the next song than showing off any dialogue writing abilities, but all in all the quirky and entirely believable cast won out. The feel good musical stylings make it well worth watching. And if you want to believe in the power of the love a family has for one another, then watch and be amazed.